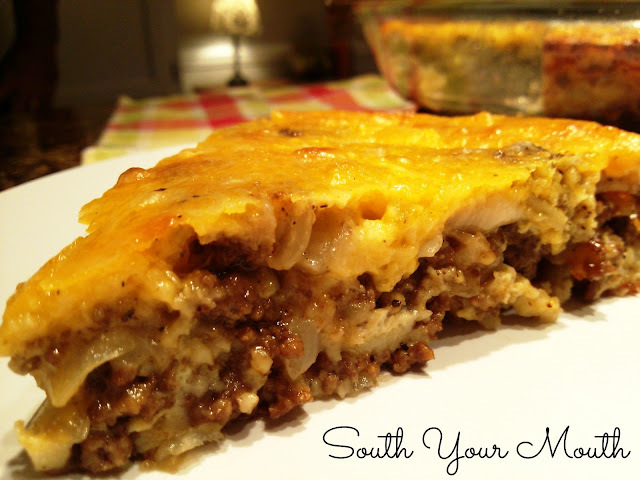 Ground beef, onions and cheese make a quick dinner with this Cheeseburger Pie. This recipe uses flour in place of Bisquick. So, we’re on that stretch before payday when all I have left in the freezer is ground beef. And I swear to you, if I eat one more plate of spaghetti, I’m going to lose my shiz. Since we’d already had Hamburger Steaks with Cheddar and BBQ Onions, cowboy beans and meatballs in the last week, I was wracking my brain trying to think of something else to make with it. I remembered seeing a recipe for something like this on the back of a Bisquick box once upon a time and thought I’d try to recreate it. Since I didn't have any biscuit mix (no, I can’t even make biscuits out of Bisquick), I decided to use regular flour and hope for the best! p.s… it totally works. This was really good. It’s kinda like a quiche and kinda like a breakfast casserole. As a matter of fact, I think I’m totally going to use sausage in this someday and call it just that! Cook ground beef and onion over medium-high heat until meat is browned and cooked through. Drain fat from meat mixture and set aside. Add flour to a large measuring pitcher or medium bowl. Slowly pour milk into flour and whisk to combine (if you add the flour to the milk vs. doing it this way, the flour will clump). Whisk in dry mustard, pepper, salt and eggs. Mix the onion soup mix into the meat mixture then add half of cheese and stir to combine. Spray a 9-inch pie plate with cooking spray then spoon meat mixture into pie plate. Top pie with remaining cheese. Slowly pour milk mixture evenly over pie. Bake at 375 degrees for 30-40 minutes or until pie is golden brown and bubbly. Remove pie from oven then let rest for 10 minutes before serving. I think the next time I make this I might garnish the pie with dill pickle slices or fresh tomatoes slices before baking. The old "original" recipe from the'80's had you add sliced tomatoes and then the cheese about ten minutes from it being done. I still make it this way. It's a great recipe! I use pickles n tomatoes on this as well as blue plate mayo n mustard mixed together n layered on top of beef then topped with milk n flour mixture. So delish! Can you tell me where do you put in the dry soup mix? I must be missing it! I made this and mixed in the dry soup mix with the milk/flour mixture. Oh my blog!! I totally screwed that up, didn't I?! You add it in with the cheese. I just edited the recipe. THANK YOU for asking!!! I'm sure a lot of folks would have just never put it in! While you mix flour into a measure cup and add your milk and other dry seasoning - you never mention when you add this mixture to the recipe. Does it go on top of the meat mixture in the pie dish? Then bake??? I tried this and was disappointed in the texture and the overwhelming taste of cheese. I think the flour mixture should have baking powder added to make it fluff instead of just being doughy. No one cared for it so won't make it again. No problemo LOL. I read the recipe over four times thinking that I was just not seeing it :) but I'll let you know how it comes out with it in the milk mixture. I added it with the hamburger and onion, it worked out well! Delicious! Stopping by from Weekend Potluck @ The Better Baker. Your recipe sounds delicious! I love cheeseburger pie but you have to put ketchup and mustard in the meat mixture like my mom did when I was little that is what makes it takes just like a McDonald's cheeseburger. For those of us that can't have onions or don't like onions can you substitute something else or just leave it out? Maybe try mushrooms and Beefy Mushroom soup mix! Oh my goodness! Make this like a mushroom and Swiss burger! Of course, I'll have to make a bacon cheese one for my husband and son, since mushroom and Swiss is "too exotic" for their taste... thanks for the dinner idea! Thanks for a non-Bisquick, updated twist on an old standard! I didn't have the soup mix so added half a pack of brown gravy mix. Also sauteed green pepper and a tad of bacon (only a strip and a half, really) with the onion. Some of us ate it with sour cream; others with ketchup and mustard and lettuce. All agreed it was good! Im making it right now, cant wait to see what it taste like, when my husband seen what i was making his eyes got so wide and his mouth dropped.. he cant wait either..
Omg my friend Karen f. Makes the best hamburger pie!! I added a crescent roll crust, and it was awesome! Great recipe!! Think I will try this. Delete the flour and add hash browns. What do you think? Got this in the oven now! Instead of using dry mustard, which I never have, I used yellow mustard. Alright now, this may sound weird, but being on a tight budget while in nursing school, I've come to realize how cheap, yet versatile corn is. I use it as a filler for a lot of casseroles, even tacos hahaha. So I added it to this recipe as well. Hope it comes out ok with the addition :) My kitchen totally smells like a diner right now LoL!!! In 10min I'll find out if my picky daughter and husband like it :) smells awesome! I added some crumbled bacon, it was awesome! I made this last week and it came out fabulous. Much better than the bisquick one. When the guys like a dish I make, it is a win win. Doesn't happen often, but with this dish it did.. Thanks so much for a great, simple recipe. 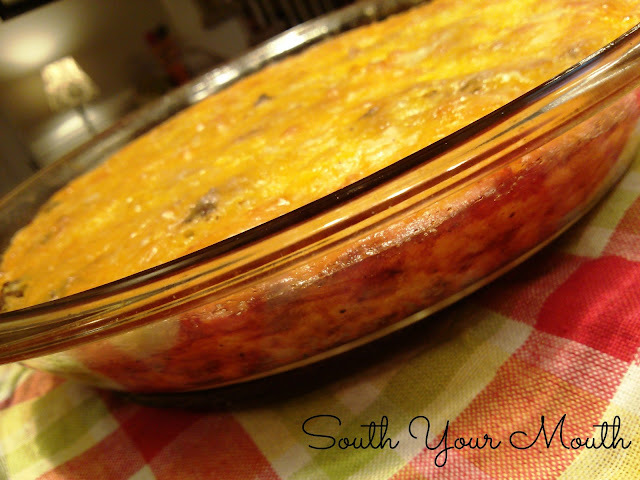 This was the very best Cheeseburger Pie I have ever made or tried. Even the guys in the house liked it, and that is definitely saying something. I'm not a great cook, but this was a total success. Thanks for such a great recipe!! YUM!! I made this today and took it to a potluck. It was consumed quickly, and I had several favorable comments. I have made hamburger pie in the past but I did not add onion soup or put cheese inside, just on top. Today I did use beefy onion soup because that is what I had and cheese inside and on top. Delicious.